A WebmasterWorld thread has several Google AdSense publishers already excited to kick off the new year in anticipation for strong earnings in 2012. 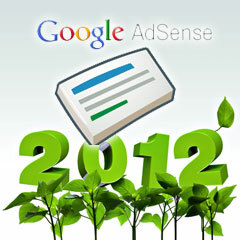 Publishers are expecting 2012 to be their best year in terms of earnings with the Google AdSense product. Must admit I've had a very fine AdSense year in 2011, and I am working on building my site so that next year is even better! Looking to hit my first triple digit day in 2012, came very very close in 2011, I'll work hard to see it does in the next year. I had a good run in 2011 - managed to add one more figure to my monthly AdSense earnings. January historically is not a bad month for me. What are your hopes and plans for January and the new year? So what are you planning to do to maximize your Google AdSense earnings? Image credit on ShutterStock for 2012 growth image.